This week we have drawn the owl card. Owls have the ability to see with great detail in the darkness of the night. Yet what they symbolize to most of us is wisdom, not vision. 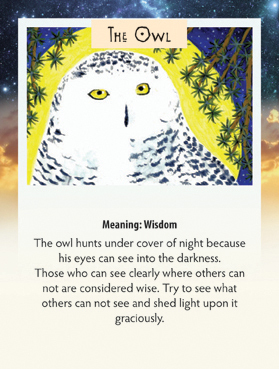 So for me, what this card indicates that for this week, we can practice seeing into the depths of a situation and shed light on something that may be hidden, but share that information with great wisdom. Shedding light on a situation at the wrong time may do more harm than good. I am currently reading “Beyond Religion: Ethics for a Whole World” by the Dalai Lama and highly recommend it to everyone. He believes that all human beings have the potential to grow in their own personal wisdom. If you see something you think is not right, try to find a way to bring it to that persons attention in a way that allows them to grow out of that behavior. I also want to tell you that some friends and I started a new facebook page, Wide Awake Network. Please go to facebook and friend us! Our long term plan is to build a network of products and people of wisdom over the next few years. Please join us and contribute YOUR wisdom!